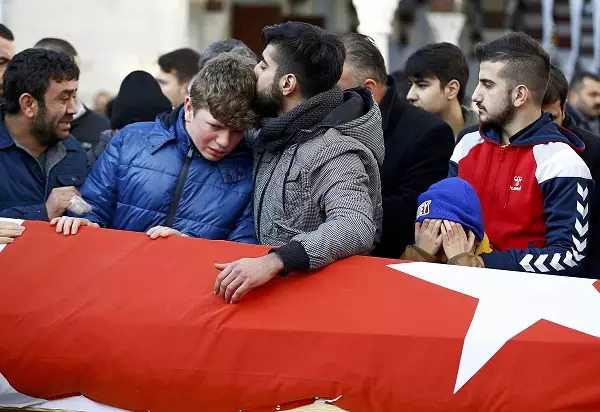 As the hunt intensifies for the gunman behind Turkey’s New Year nightclub massacre, security forces are seeking clues at the scene of the bloodbath. At least 39 people were shot dead at the iconic Reina club in Istanbul, including many foreigners, just over an hour after revellers welcomed in 2017. Dozens more were injured – some of them visited on Sunday by Turkish Prime Minister Binali Yildirim. Yildirim told reporters the attacker left his gun at the crime scene and fled, taking advantage of the chaos. And he contradicted earlier reports that the killer was dressed as Father Christmas. “I have been hearing…that the terrorist supposedly wore a Santa Claus outfit…There is no truth in this,” Yildirim said. Some in the upmarket Reina nightclub jumped into the waters of the Bosphorus to try to escape the carnage and were rescued by police. The club lies on the European side of the Bosphorus Strait, which splits Istanbul in two. Wielding a Kalashnikov, the attacker opened fire on police outside the club at around 1.15 am local time, killing at least one police officer and one civilian. Once inside the venue, the shooter began firing at random. Among the up to 800 people inside the nightclub, some witnesses said there were multiple attackers, shouting in Arabic. A total of 65 people were wounded in the gun rampage. Four are in a critical condition. Turkey’s Hurriyet newspaper quoted Reina’s owner, Mehmet Kocarslan, as saying security measures had been taken over the past 10 days after US intelligence reports suggested a possible attack. US President Barack Obama has directed his team to offer “appropriate assistance to the Turkish authorities,” the White House says. “This afternoon the president was briefed by his national security team on the attack in Istanbul,” said spokesman Eric Shultz in a statement. The EU’s Foreign Affairs chief, Federica Mogherini, also expressed support for the victims, their families and their friends. NATO Secretary-General Jens Stoltenberg expressed his condolences and condemnation. Tragic start to 2017 in #Istanbul. My thoughts are w/ those affected by the attack on people celebrating New Year and w/ the Turkish people. Officials say 24 of the dead were foreigners, including nationals of Saudi Arabia, Lebanon, Israel, a Turkish-Belgian dual citizen and a Franco-Tunisian woman. Eleven Turkish nationals died. Among the Turkish citizens shot dead was Ayhan Arik, a tourism agency employee who took some of the revellers to the nightspot. There were emotional scenes at his funeral on Sunday, attended by his wife and two young sons. 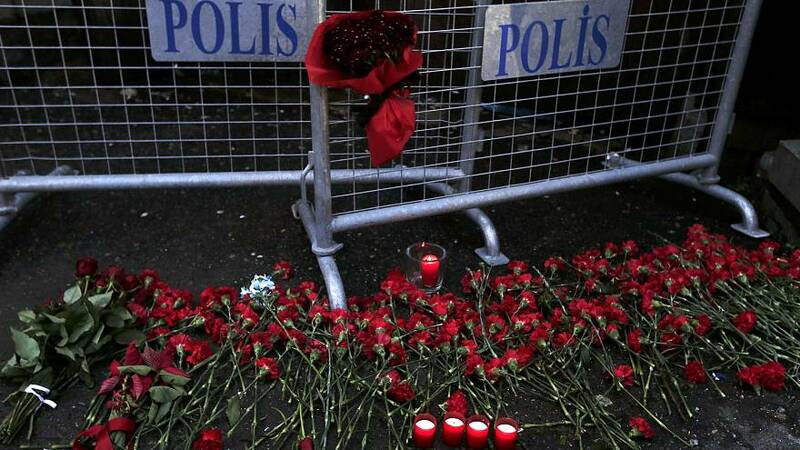 Shortly after the attack, police were reportedly ordered to temporarily close all nightclubs in Istanbul. A blackout has been imposed on national media coverage of the shooting. It marks a bloody start to 2017 for a country hit repeatedly by terrorism last year – with attacks blamed on ISIL and Kurdish militants. Turkey is a NATO member and part of the US-led coalition against the so-called Islamic State group.